LIBRA is a legal management software, powered by Vakilsearch, a Chennai-based company that enables lawyers to keep track of finances and manage their practice daily. It helps legal practitioners stay on top of their work by providing a one-stop platform for all their queries and work. Everything from managing accounts to researching on cases can be carried out efficiently by this app, making the lives of lawyers easier than ever before. Less paperwork leads to lawyers having more time to work on their cases and hence better their practice. A comprehensive dashboard that gives you access to everything instantly. Track time spent efficiently, making billing a lot easier. The document vault will be the main focus of this article. So here’s a look at everything you need to know about the vault. 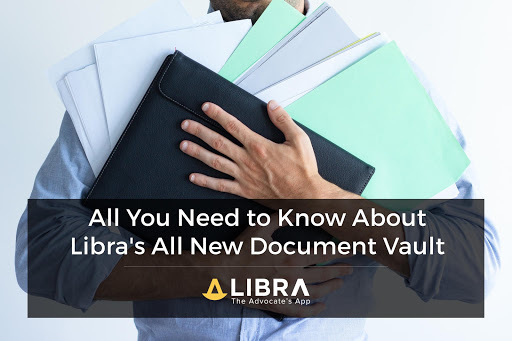 The document vault is one of the best features of the LIBRA app as it enables lawyers to upload and maintain sensitive documents and records pertaining to their cases. The personalized document vault is secure and has a storage capacity of 10GB, helping you consolidate your data in one place. The useful Document Vault inbuilt in LIBRA helps you store information and documents regarding a case. After upload has become complete, click on Save to finalise the storage of the document. Currently, the app allows you access to 20GB for a single Login. The company is planning to expand this capacity to 100 GB. Further, each document uploaded can be up to a maximum of 7 MB in size. LIBRA not only allows you to upload files from your Drive but also allows you to click pictures of the documents in front of you instantly and then enables you to store that in your document vault. The app accesses your camera to allow this functionality that lets you upload documents on the go with ease. Photos from your Gallery or Photo Library can also be easily uploaded onto the vault. The Magic Link allows your clients to upload documents relevant to the case from their side. When you decide to let your client add a document, share a magic link with them through messenger or a simple text. The link once opened by them gives them access to upload a file onto the app. Once the upload is complete, the file will automatically be added to the vault, thereby giving you access to it. This functionality is available under the Get Docs option on the menu. The Document Vault, therefore, enables you to have all the files required for the successful study of a case under one roof; safe and secure. High levels of encryption and secure building of the app ensure that the files uploaded are safe thereby giving you a secure vault to store your sensitive information in effectively. Hence, you never have to worry about a break-in or misplacement of files. The app is extremely organised, and hence you never have to tidy up your desk again. Pen and paper management of cases leads to problems with efficiency because of cluttering. With so much information coming in every day, it becomes difficult to keep track of everything in a neat and organised manner. This is why apps such as LIBRA have grown to become so successful as they let you store documents in an orderly fashion that makes researching and going through them more accessible than ever before. As technology grows, it has become imperative that we use new services to stay updated and efficient. The LIBRA app comes to the rescue of legal practitioners by simplifying the process of keeping track of cases. Make sure you never happy unhappy customers by tending to all their needs using this app. Next Post How Relevant are Electoral Bonds in this world?